This entry was posted in Letting Go and tagged darren l johnson, happiness, Letting Go, letting go of stuff, stress, weight loss. Bookmark the permalink. 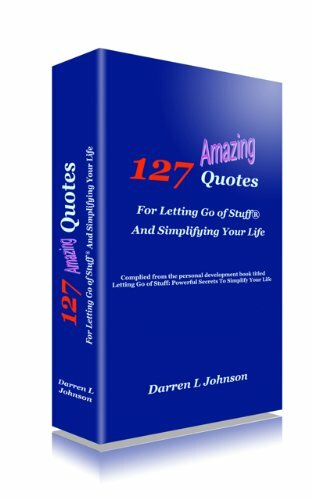 Darren – love your “getting rid of stuff”. You are so correct about the things we say to ourselves are the things that are self-limiting. I suggest that people get in the habit of being mindful of these statements, and then replace them with positive affirmations. Be your own best friend! Great comment Lianda. I always suggest that we develop a relationship with ourselves before attempting to get in to a relationship with someone else. Oftentimes people get in to a relationship with someone else with the unconscious goal of getting fixed” by the other person. The truth is that we really need to STOP trying to get fixed and focus more on getting healthy – emotionally, spiritually, and physically. Healthy leads to happy – over time. Loving ones self is the key to it all, in my opinion. Darren, I really like your suggestion about writing down what you tell yourself. It may be pretty confronting at first however I guess that’s the point. If we can’t be honest with ourselves how can we ever create the life we want. Thanks for the insight. Also just letting you know ALIGN EXPAND and SUCCEED Shifting the Paradigm of Entreprenerial Success is being launched today and there is over 100 FREE offers available just for the launch. It would be great to let your network know it would support everything you do.